Super Bowl LIII's's Big Question: Where in the L Does the Point Total Land? Super Bowl LIII's Big Question: Where in the L Does the Point Total Land? Continuing a recent trend, it's now the Super Bowl's turn to be center stage in the Game of Whales. The big dudes are back, making seven-figure plays. One in particular is attempting to continue his impressive hot streak. For the record, he's part of the last-minute wave that's breaking on the Los Angeles Rams. Interestingly, with most sportsbook lines having dropped to New England -2½, the world's biggest online book seems to be offering a bargain for Rams punters. 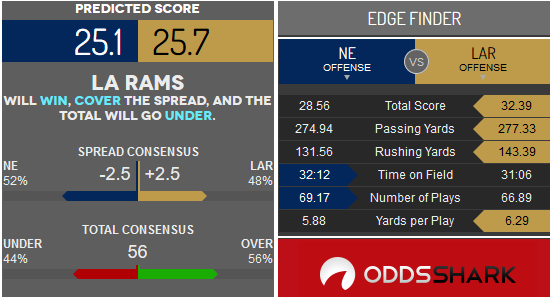 Bovada is sticking with its line of New England -3 with a total of 56½ and the moneyline set at New England -145 and the Los Angeles Rams +145. Many of the humongous plays are being made on the moneyline, which is ballsy in its own right. That sorta confidence must be why they're whales. What we're seeing, though, is the total looks to be a better choice for us mere mortals. The Rams and Patriots each ranked in the top four in scoring and top five in yards and allowed the same amount of yards per game defensively. New England’s defense ranked seventh in points allowed, the Rams 20th. Now, let’s take a closer look at why betting the over or under is the smart play in Super Bowl LIII. Both teams score at will. The Patriots rank 4th in the NFL in points per game and average 27.2 per. They scored 41 versus the Los Angeles Chargers in a crazy 41-28 over game. They scored 37 against the Kansas City Chiefs in a wild 37-31 over game. The Rams are the second-highest scoring team in the NFL at an average of 32.9 points per. They beat the Dallas Cowboys 30-22 in the Divisional Playoffs in an over game. Although both teams score lotsa points, they also play decent defense. The Patriots only allow 20.3 points per on average. That ranks 7th in the NFL. Over the total went 5-11 in New England’s 16 regular season games. The total went 8-8 in the Rams’ 16 regular season games. Los Angeles only allows 24 points per game on average. At first glance, it looks like this game should go over by a mile. After all, the Rams average over 32 points per. New England only averages 24, but they’ve stepped it up big time during the playoffs. The over/under total has plummeted, though. If both teams can score at will, if both have such creative offenses, why did the line fall so quickly? The Pats do average lotsa points. However, they’ve developed a viable rushing attack. Sony Michel had 3 touchdowns against the Chargers. Rex Burkhead scored 2 touchdowns while Michel had another 2 touchdowns in the win over the Chiefs. That’s 4 rushing touchdowns for the Patriots in the AFC Championship. But New England might find it harder to rush against the Rams' defensive line: Michael Brockers, Ndamukong Suh, and Aaron Donald. That’s why under players have been all over the total. Not only can Donald, Suh, and Brockers take away the Patriots’ rushing attack, they can also pressure Brady by themselves. If linebacker Corey Littleton can cover Rob Gronkowski, that takes away a hot read. The Pats must then come up with a game plan to beat the Rams’ secondary. It doesn’t mean they won’t. It just means New England must play a different game than the one that led to the point explosions against the Chargers and Chiefs. Whatever the approach ends up becoming -- and face it, nobody makes game plan adjustments like Bill Belichick -- you can be sure New England will try to limit the Rams’ possessions, just like they limited Kansas City’s in the AFC Championship. Mainly because of the Patriots' run-based, clock-chomping strategy, Super Bowl LIII should go under the total. Aspiring to become the Mark Twain of sportswriting, Josh has been labelled as the up-&-coming sportswriter of the year by absolutely nobody and the new heavy hitter in sports handicapping by his mother.